I don’t know economics. That’s why I am taking an international economics and trade course. A lot of it is over my head. But I do understand politics and some law and governance and that sort of thing. I also understand aesthetically pleasing architecture, which was the highlight of my visit to Lloyd’s. Over looking Lloyd's from the middle floor. This doesn't even do the office space justice. This bell is still used. What happens at Lloyd’s is the process of negotiating and signing for the risk. “Brokers bring business into the market on behalf of clients, other brokers and intermediaries. As with any market, brokers shop around to see which syndicates can cover their specific risk – and on what terms,” according to the brochure. Lloyd’s has an approach in which individual needs are met, rather than one getting an “off-the-shelf” package. The system is kept somewhat traditional in which a paper book of losses is kept and written in with a quill pen. But of course they have computers and all sorts of modern technology. According to my guide, a quarter of the world’s ships are insured at Lloyd’s. And they insurance many other sort of items from antique cars to Microsoft to works of art to film stars to footballers to the 2012 Olympics to rock stars. 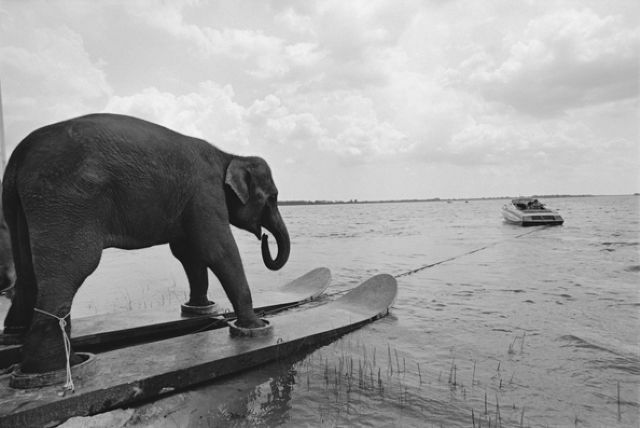 I’d say the most fascinating thing they’ve insured is a pink water skiing elephant, which appeared in Honky Tonk Freeway. What I liked most about Lloyd’s, however, was the architecture of the building. It was built by Richard Rogers and was constructed “inside out.” The buildings gears and cranks are exposed and are primarily on the outside. The inside hosts an open office space built with exposed steel and lots of glass. It’s certainly a gem that shimmers. Who thought escalators could be so impressive? This is Lloyds, and these are people at work.